Less than one week left to book your World Championships hotel! Drum Corps International wants to help you get more fun and comfort out of your dollar this summer. If you're still looking for a hotel room for the 2008 World Championships, we invite you to join us in downtown Indianapolis! Even better, by booking now, you won't have to worry about getting a rental car when you use our complimentary fan shuttle bus service to and from Bloomington, Ind. to see all three nights of championship competition! The deadline to take advantage of specially priced Indy hotel rooms for the '08 World Championships is Wednesday, July 9. The main event will be a short 55 miles from the Circle City, but there's tons for fans to do in Indianapolis when not watching the exciting performances of Marching Music's Major League. Indianapolis will be host to the Individual & Ensemble competition on Wednesday, Aug. 6, as well as numerous receptions, social gatherings, and other activities hosted by corps and alumni groups. On top of that, with all the outstanding dining, recreational, and nightlife opportunities available in downtown Indianapolis, where else would you want to go? And if rising gas prices have got you down, you can rest easy and leave the driving to us. Or rather, to Star of America Charter Services, who will be operating our free shuttle service to and from Memorial Stadium in Bloomington. Star of America will give you a taste of the life of a touring corps member, or take you back to your own days on the road with a drum corps. On the bright side, you don't have to sleep on a gym floor when you get back to your housing site! This is one offer you shouldn't pass up! The deadline to book is less than a week from today, on Wednesday, July 9. 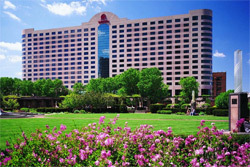 Head over to DCI.org/IndyHotels to book your hotel room! Check out DCI.org/Shuttle for a complete fan shuttle bus schedule and to reserve your ride today! If you have additional questions or comments, please contact Drum Corps International at 317.275.1212, or send an email to shuttle@dci.org for shuttle inquiries, or housing@indianapolis.org for questions about hotel reservations.